For other uses, see Eltham (disambiguation). 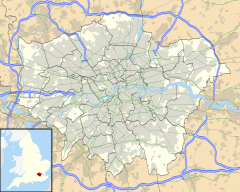 Eltham (/ˈɛltəm/) is a district of southeast London, England, within the Royal Borough of Greenwich and the historic county of Kent. It is 8.7 miles (14.0 km) east-southeast of Charing Cross, and is identified in the London Plan as one of 35 major centres in Greater London. The three wards of Eltham North, South and West have a total population of 35,459. Eltham lies in the hundred of Blackheath, at the distance of eight miles from London, on the road to Maidstone. The parish is bounded by Woolwich, Plumsted, and the extraparochial hamlet of Kidbrooke, on the north; by Bexley on the east and south east; by Chislehurst on the south; by the extraparochial hamlet of Mottingham, on the south-west, and by Lee on the west. It contains about 2,880 acres (11.7 km2): of which about 360 are woodland; about 60 waste; about three fifths of the cultivated land are arable. ....This place had formerly a market on Tuesdays, and two fairs; one at the festival of the Holy Trinity, and the other at that of St. Peter and St. Paul; both of which have been long discontinued. Eltham lies on a high, sandy plateau which gave it a strategic significance. That, and the fact of its position close to the main route to the English Channel ports in Kent, led to the creation of the moated medieval Eltham Palace, still its most notable landmark. Daniel Lysons described its origins. The Kings of England had a palace at Eltham at a very early period ... Henry the Third, in the year 1270, kept a public Christmas at his palace of Eltham, being accompanied by the Queen, and all the great men of the realm. Anthony Bec, Bishop of Durham, and Patriarch of Jerusalem, bestowed great cost, we are told, on the buildings at this place, and died there on the 28th of March 1311, having, as it is said, some time before given Eltham-house to Edward the Second, or, as some say, to Queen Isabel.... Edward frequently resided here. In 1315, his Queen was brought to bed of a son in this palace, called, from that circumstance, John of Eltham. Edward the Third held a Parliament at Eltham in 1329, and again in 1375. The nearby manor of Well Hall was home to Sir John Pulteney, four times Lord Mayor of the City of London, and later to wealthy Catholic William Roper and his wife Margaret (daughter of Sir Thomas More, known to Catholics as Saint Thomas More, Chancellor to King Henry VIII). In 1733 Sir Gregory Page bought this estate for £19,000 and demolished Roper House, building Page House – later known as Well Hall House – on the site. Until its demolition in 1931, Well Hall House variously served as a home to watchmaker John Arnold, and later to socialist Hubert Bland and author Edith Nesbit. Also of note is Avery Hill Park and its former mansion, accessed from Bexley Road and at various points along the three miles (5 km) of other streets that surround the park. Avery Hill was the home of Colonel North, who made his fortune working in the Chilean nitrate industry. A hothouse is still open to the public and contains temperate and tropical plants. There are also remnants of the formal gardens in the public park. Today the mansion is part of the University of Greenwich, which has been a significant presence on two sites in the area. However, in 2014 the University announced its intentions to withdraw from the site. The village streets adjacent to the Palace, and the surrounding land, remained rural until Archibald Cameron Corbett bought the Eltham Park Estate and developed it with well-built suburban housing between 1900 and 1914. The Bexley Heath Railway (see below) had opened what came to be known as the Bexleyheath Line in 1895. Suburban development of the district accelerated when the Government, through His Majesty's Office of Works, built the Progress Estate in Well Hall and large estates of temporary hutments in 1915, to house the vastly increased numbers of wartime workers in the Royal Arsenal at Woolwich. In the early years it was called, rather pretentiously, "Well Hall Garden City". Its name was changed to "Progress Estate" when it was purchased by the Royal Arsenal Co-operative Society in 1925. It compares well with later groups of municipal housing in south London – which is surprising given the fact that it was constructed rapidly between February and December 1915 and is sub-divided by the South Circular Road and (until about 1988) by the even busier A2 Trunk Road. The Progress Estate was made a Conservation Area in 2007. After World War I the building of housing estates continued unabated. By the beginning of World War II, four large estates were in existence: the Progress Estate (1915), the Page Estate (1923), Middle Park (1931–36), and Horn Park (begun 1936, completed 1950s). The latter two were built on Eltham Palace's former hunting parks. Coldharbour Estate was built in 1947. The small council estates of Pippenhall and Strongbow Crescent were completed about 1960. Since that time new house building has been limited to small private "infill developments" and replacements for demolished properties. Eltham residents occupy a housing stock of mixed age, particularly towards Eltham Park and the multiple streets with 'Glen' in their names. There are some fine houses scattered around Eltham. At least two roads, North Park and Court Road, contain million pound homes, and some of the older Victorian buildings have been subdivided into apartments. A Micropub, The Long Pond, was opened in December 2014 - the first pub in Eltham Park for at least 115 years as Archibald Cameron Corbett would not give permission for pubs and put a restrictive covenant on the land. However, since the Licensing Act 2003 was implemented in 2005, Premise Licences are now granted by the local authority (Greenwich London Borough Council) instead of magistrates, as long as the applicant satisfies the council and the "responsible authorities" (such as Police, Environmental Health, Fire Service) that they will uphold the four licensing objectives (prevention of crime and disorder; public safety; prevention of public nuisance, protection of children from harm), then a licence will be granted. Several licensed premises in Eltham Park now offer "Off Sales". Flats. c1980. Replaced Victorian villas. Flats. c2012. Replaced old swimming pool. In 1990, an IRA bomb outside the Eltham Palace headquarters of the Royal Army Educational Corps injured seven people (see 1990 Eltham bombing). The area was targeted three times by the Mardi Gra bomber in the 1990s. Eltham has a varied topography. Map 6 shows contours, spot heights and water courses. The centre of Eltham is on a plateau at about the 60m level with the High Street running along its centre. There is a scarp slope to the west of the plateau from the top of which are unrestricted views across South London. Eltham Palace occupies a commanding position on the edge of the scarp. Eltham Hill offers the steepest descent from the plateau, starting at Eltham High Street and descending 30m over 1 km due west at the Yorkshire Grey (now a McDonald's outlet). The land to the north of Eltham rises to form the southern slope of Shooter's Hill, one of the highest points in London at a height of 130m. The recently (2014) restored 18th century belvedere Severndroog Castle offers wide views from its observation platform which is 150m above sea level. From Eltham Church at 60m the High Street rises gently to 71m and continues east as Bexley Road at a slightly lower level. Eltham is devoid of any major water features, although the River Thames is approximately 2 kilometres (1.2 mi) away from Eltham's northern limits. The most prominent body of water is the River Quaggy which runs to the south-west of Eltham and joins the River Ravensbourne at Lewisham. The Quaggy receives additional water from Mottingham Tarn and feeds the wetlands in Sutclife Park. The only other significant watercourse is the River Shuttle, which rises in Avery Hill Park and flows east to join the River Cray. There is a large variety of open green space in Eltham, in the form of parkland, fields and woodland. "Green Chain Walks" are signposted footpaths that run through or link the green spaces. Some are also bridleways or cycle routes. Avery Hill Park is large, open parkland, to the east. It is most notable for its Winter Garden, a hothouse containing tropical trees and plants from around the world. The parkland was acquired by the London County Council in 1902. Oxleas Woods, Castle Wood and Jack Wood, directly north of Eltham, is a Site of Special Scientific Interest. Oxleas Wood covers 190.3 acres (0.8 km2) and is at least 8,000 years old. The wood is home to specimen of tree including oak, silver birch, hornbeam and coppice hazel. Severndroog Castle, built in 1784 as a memorial to William James of the East India Company, stands in Castle Wood. Sutcliffe Park is a 35 acres (0.1 km2) park at the westernmost point of Eltham. Previously known as Harrow Meadow, the parkland was reclaimed from the River Quaggy in the 1930s. The Quaggy was diverted into culverts, and the park officially opened in 1937 as Sutcliffe Park, named after the Borough's engineer. On 26 June 1954, the athletics track in Sutcliffe Park was opened, and has since been home to the Cambridge Harriers. In 2003, the park was re-landscaped as a wetland area. The River Quaggy was allowed to flow above-ground in the area, for the first time in 70 years. The park borders the Ferrier Estate, which was completed in 1970 and demolished by 2012 to make way for "Kidbrooke Village". The Royal Blackheath Golf Course and the adjoining Tarn date back to Tudor times. The golf club, founded in 1766 to the north in Blackheath and to the south since its merger with Eltham Golf club in 1923, is the oldest golf club in the world outside Scotland. The club house Eltham Lodge is a grade I listed building. Eltham Park North and Eltham Park South are the final major green areas in Eltham. The southern park is adjacent to the Eltham Warren Golf Course. Eltham Parks North and South, Avery Hill, Sutcliffe Park, The Tarn and Well Hall Pleasaunce all have Green Flag status. In the 1990s the defence of Oxleas Wood to the north east of the town became a focus for a pan-European campaign to resist high capacity urban roads. Significantly the European Court of Justice found the UK government at fault for not adequately assessing the environmental impact of the planned road, that would have joined Beckton to Falconwood and perhaps – if objectors' fears are to be believed – been a first stage of a wider orbital road through Catford (a revival of a Greater London Council-backed Ringway Two). The Royal Borough of Greenwich maintains an online directory of open spaces. Most parks have active Friends groups of which the following maintain web sites. In December 2010, the population of Eltham parliament constituency was 63,059, although this figure includes the wards of Coldharbour and New Eltham, Kidbrooke with Hornfair and Shooter's Hill. 63,082 people live in the SE9 postcode district; of these, 30,398 are male and 32,684 are female. People over 65 make up 17.9% of Eltham's electorate. The town centre supports a loyal core of shoppers, diners, and drinkers, but the nightlife is modest. In recent years there has been great effort by local town centre businesses and other important Eltham stakeholders, to drive business, community and tourism improvements, that will help sustain the town centre. These efforts have resulted in the formation of an Eltham town centre partnership (ETCP), chaired by an elected local stakeholder. Greenwich council have member and officer representatives and the University of Greenwich whose Avery Hill Campus borders the Town Centre is also represented. The ETCP have encouraged the development of A new town centre commerce Association – The Association of Commerce for Eltham (ACE). ACE has established a new Town Centre web portal, which, as well as providing a basic business directory also provides mechanisms for encouraging interaction between business and community groups. The ETCP is currently trying to encourage the University of Greenwich, to undertake research projects into business and community development, based on Eltham town centre. In 2007, the new Eltham Centre opened just off the High Street including council offices and a new swimming pool and incorporating the early 20th century library. The Eltham Society was founded in 1965 with the aim of "Preserving the past, Conserving the present, and Protecting the future". In 1993 it erected the Eltham Town sign in the high street. The Society is responsible for various publications. In 2006 the community magazine "SEnine" was launched. It is published monthly and distributed free. As well as news and discussion of current affairs it also lists forthcoming events. It also carries many illustrated articles about Eltham history. Digitised copies of old issues are available on the SEnine website. A community website "This is Eltham" provides updates on current events. On 24 April 1993, 18-year-old black student Stephen Lawrence was fatally stabbed in Well Hall. The crime quickly became one of the most high-profile racially motivated murders in modern Britain. Five teenagers were later accused of his murder but the case was dropped due to a lack of evidence. In 2011 as a result of new evidence coming to light, Gary Dobson and David Norris stood trial for the murder of Stephen Lawrence. They were convicted on 3 January 2012. During the 2011 England riots, Eltham received national attention due to the fact that for three nights, a vigilante group of 200–300 people occupied the centre of Eltham, claiming to protect people and property from rioters. Extra police were sent to maintain order. The group gathered after rumours that Eltham would be the latest place to be hit by unrest. A small number claimed to be EDL members, others were supporters of local football clubs Charlton Athletic and Millwall. Police were forced to move the crowds on for fear of violence. Police were involved in minor clashes. Eltham did not have any riot damage. Primary schools in Eltham include: Alderwood, Christ Church (Shooters Hill Rd), Deansfield, Gordon, Middle Park, Ealdham, Eltham C of E (Founded 1814), Gordon, Haimo, Henwick, Holy Family, Kidbrooke Park, St Mary's, St Thomas More and Wingfield. Secondary schools in Eltham include Eltham Hill School for Girls, Harris Academy Greenwich, St Thomas More Catholic School and Stationers' Crown Woods Academy (built upon the land of King Henry VIII's hunting grounds). One campus of the University of Greenwich is in Avery Hill Park, on the borders of Eltham and New Eltham . In 1654, three men were prosecuted at Eltham for playing cricket on a Sunday, one of the sport's earliest references. Eltham has a Non-League football club Cray Valley Paper Mills F.C., which plays at Badgers Sports Ground (shared with Greenwich Borough F.C.) in Middle Park. Cray Valley plays an annual charity match against their local non-league rivals Eltham Old Boys Football Club. Eltham's parks provide many facilities for sports and fitness. Eltham Park South has a jogging track and six tennis courts. The Pleasaunce has a bowling green and pavilion. Avery Hill Park has changing rooms and half a dozen football and rugby pitches and with cricket pitches laid out in the summer. The land adjoining Avery Hill is occupied by many sports grounds which include Footscray RUFC, London Electricity Sorts and Social Club, Charlton Park RFC, Sparrows Lane Sports Ground, Cambridge Mission Sports Ground, Unilever Sports Ground, Metrogas Amateur Sports Association, St James Mar Thoma Amateur Sports Ground and the SRC2 Sports Club. The same area is also home to the training ground of professional football club Charlton Athletic at Sparrows Lane. Preserving these sports areas from the encroachments of property developers is a constant battle for Elthams environmental and community groups. Currently (2014) the focus is on the long disused Gaelic Sports Field in Avery Hill Road, for which there is a planning application to build 150 houses. Eltham, along with most other suburbs in south east London, is not served by the London Underground. Commuters rely on two rail lines to central London, and the road network. Trains through Eltham terminate at London Charing Cross, London Cannon Street or London Victoria in a westerly direction, and Crayford, Dartford, Slade Green, Gravesend, Gillingham or Rochester in an easterly direction. Given the lack of London Underground access, the two suburban rail lines work at, or above, their capacity during peak-hour commuting to central London. Fast trains take as little as 20 minutes to get to London Charing Cross. Originally opened on 1 May 1895 by a private company, the Bexleyheath Line was taken over by the South Eastern Railway after it suffered bankruptcy. There were originally two stations in Eltham: Eltham Well Hall and Eltham Park. Eltham Well Hall station opened in 1895. Eltham Park station opened (after a prolonged legal wrangle) on 1 July 1908. On 11 June 1972, a London-bound train came off the track at Well Hall, killing 6 and injuring 126. Both Eltham stations were closed in 1985 and replaced by a new ‘Eltham’ station; this coincided with the construction of the Rochester Way Relief Road part of which was built on the site of Eltham Well Hall station. Glenlea Road between Well Hall Road and Archery Road was replaced by the station forecourt and a bus station (this had previously been adjacent to Well Hall station). The new rail station was built above the new road at the point it travels through what is sometimes referred to as 'the Eltham tunnel'. The new station has a modernist feel. The Dartford Loop line, about 1 kilometre (0.6 mi) south of Eltham High Street, was opened by the South Eastern Railway on 1 September 1866. It is commonly known by locals as the 'Dartford line via Sidcup'. There are two stations on this line that serve the population living to the south of Eltham: Mottingham station, originally named 'Eltham Station' until 'Eltham Well Hall' opened, and New Eltham station. Neither station is as large as Eltham station, but both have been heavily upgraded since opening. Eltham High Street lies on the A210, the original A20 London to Maidstone road. But the A20 has now been diverted southwards, passing through Mottingham, and it is a dual carriageway that connects to the M20 motorway in Kent. Similarly, to the north, the dual carriageway A2 has replaced the Rochester Road section, which was always very congested (the old road had dangerous readings of lead pollution, close to schools, before the advent of lead-free petrol). The upgrading of these two arterial routes in and out of London means that Eltham is handily positioned between the A20 and A2. Driving on either of these roads into London soon results in congestion, although the A2 does connect through to the Blackwall Tunnel under the Thames, and thus into east London, all on dual carriageway. Driving eastwards allows access to the Dartford Tunnel, and the Kent countryside, in as little as 20 minutes in off-peak hours. Crossing the two from north to the south is the A205 South Circular road, a busy arterial route. The back streets of Eltham have been largely traffic-calmed by the local Council, but there are chronic rat-runs as many of the measures are ineffective or insufficient. Provision for cyclists is modest, while there are some interesting footpaths along ancient rights of way, for example in Oxleas Wood and Avery Hill Park. Scheduled coaches, marketed as part of the National Express network, link Eltham Green to Pimlico and Victoria in central London and to several destinations on the Kent coast via Bluewater (a retail-based development on a grand scale in Dartford borough) and Canterbury. Eltham Green is one of the few places in south London served by National Express coaches. Eltham is served by 15 Transport for London bus routes. Most pass through Eltham High Street, the only exceptions being the 122 and 178. 321 – New Cross Gate station and Foots Cray Tesco. 24-Hour Service. N21 – Trafalgar Square and Bexleyheath Shopping Centre, previously Foots Cray Tesco. John Arnold – Internationally renowned watchmaker, lived in Well Hall House. John Ayldon – An operatic bass-baritone and former member of the D'Oyly Carte Opera Company. Hubert Bland – Socialist and co-founder of the Fabian Society. Lived in Well Hall House from 1899 to 1922. Billy Bonds – MBE a former Charlton Athletic, West Ham United Footballer, and former Millwall F.C. manager. Bridget of York – Princess, seventh daughter of Edward IV. Thomas Burke, author, was born in Eltham. Kate Bush – Singer and musician. Conflict, Anarcho-punk band, some of whose members originated in Eltham. Sir Stephen Courtauld M.C. – Millionaire, war veteran and philanthropist. Lived at Eltham Palace from the mid-1930s to 1944. Robert Devereux, 3rd Earl of Essex Commander of the Parliamentary Army. Last resident of Eltham Palace where he died. Boy George – Singer, born and raised in Middle Park, Eltham. W. G. Grace - the most successful cricketer of his age. Retired from first class cricket 1905 but continued to play for Eltham until his death in 1915. Lord Healey (Denis Healey, Baron Healey) – Politician and Deputy Leader of the Labour Party, once lived in the Eltham "Hutments". Bob Hope KBE – Actor and Hollywood film star, was born in Eltham in 1903 (blue plaque at 44, Craigton Road). In 1982, the Eltham Little Theatre was renamed the Bob Hope Theatre in his honour, following his donations that saved the theatre from closure. He also visited the theatre in 1980. Jack Hope – Film and television producer, elder brother of Bob Hope. Frankie Howerd – Comedian and comic actor, educated at Shooters Hill Grammar School in adjacent Woolwich. He also lived in the "Hutments". The Wetherspoons conversion of the Eltham branch of Barclays Bank to a pub called The banker's draft resulted in the pub being themed around Howerd. Many pictures and artefacts from his life adorn the walls. Peter Howitt – Actor and film director lived in Tarnwood Park Eltham from 1963–1970. He attended Wyborne Primary School in New Eltham from 1963–1968. Was a member of the Priory Players Amateur Dramatics Group at the Christ Church Centre in Eltham High Street between 1971–1976. Commodore Sir William James (1720–1783) – Naval commander, settled in Eltham at Park Farm Place in 1759 and is commemorated by Severndroog Castle on nearby Shooter's Hill. Richard Jefferies (1848–1887) – Naturalist and writer. (Blue plaque at 59, Footscray Road). Herbert Morrison (1888–1965) – Labour Cabinet minister and leader of London County Council, lived at 55 Archery Road, between 1929 and 1960. Edith Nesbit – Author, writer of "The Railway Children" and wife of Hubert Bland –Lived in Well Hall House. Ellis O'Reilly – Former Irish international gymnast and Olympian. John Partridge – Actor who plays the character of Christian in EastEnders resides in Eltham. Gavin Peacock – former Charlton Athletic, Chelsea, Queens Park Rangers Footballer, former football pundit for the BBC and currently studying to become a vicar. Louise Redknapp – Singer, grew up in Eltham. Steve Peregrin Took – Musician. Prof. Sir Dudley Stamp CBE. Geologist and geographer. Alan White – Ex-drummer of British Rock Band Oasis, was born in Eltham. ^ "Case Studies - Progress Estate". ideal-homes.org.uk. Retrieved 1 October 2015. ^ "YARD WARNS IRA HIT SQUADS MAY BE ACTIVE IN MAINLAND BRITAIN Bomb in flower bed". HeraldScotland. Retrieved 22 March 2018. ^ "Our History : Royal Blackheath Golf Club – The Oldest Golf Club in the world". Royalblackheath.com. Retrieved 29 August 2011. ^ Ong, Denis. "Directory: Parks, gardens and open spaces". ^ Royal Borough of Greenwich Ward Profiles: 2011 Census Data: Eltham West Accessed: 20 July 2015. ^ Royal Borough of Greenwich Ward Profiles: 2011 Census Data: Eltham North Accessed: 20 July 2015. ^ Royal Borough of Greenwich Ward Profiles: 2011 Census Data: Eltham South Accessed: 20 July 2015. ^ Royal Borough of Greenwich Ward Profiles: 2011 Census Data: Middle Park & Sutcliffe Accessed: 20 July 2015. ^ Dominic Casciani (3 January 2012). "Stephen Lawrence murder: Dobson and Norris found guilty". BBC. ^ SEnine magazine, October 2014, Page 14, "Gaelic Athletic Association - a Disgrace"
^ "Disused Stations: Eltham Park Station". Kennet, John. Eltham - a Pictorial History. (1995). Philimore and Co ISBN 1-86077-004-5. This page was last edited on 24 April 2019, at 15:00 (UTC).